As more countries recognize wildlife poaching and trafficking as serious crimes run by organized syndicates, they turn to the legal system to protect wildlife. Not only is legislation being strengthened across eastern Africa, but the capacity of law enforcement officers, investigators, and prosecutors is also strategically enhanced. In June 2014, Kenyan authorities arrested a Mombasa businessman and known ivory kingpin, Feisal Mohamed Ali. He and several accomplices were in possession of nearly 2 tons of ivory worth $440,000. Although Ali disappeared from police custody shortly after his capture, he was busted by an Interpol operation six months later in Dar es Salaam, Tanzania. In spite of various mishaps hounding his trial in Kenya, he was found guilty in 2016. Ali was sentenced to 20 years in prison and fined Ksh 20 million—about $200,000. His accomplices were acquitted due to lack of evidence. Meanwhile, a notorious Tanzanian kingpin managing up to 15 syndicates across Eastern Africa was arrested in 2015. For smuggling 118 tusks worth $863,000, Boniface Matthew Mariango—also known as “The Devil”— received a sentence of 12 years, with acquittals on several other charges of wildlife crime. Elephant tusks are not the only wildlife parts changing hands between poachers, middlemen, and exporters. A driver named Emmanuel Richard was arrested in Dar-es-Salaam for possession of five hippo teeth valued at $1,500 without a permit. He was found guilty of the offense and sentenced on December 19, 2017 to 20 years’ imprisonment. This is the minimum prison term under the 2016 amendments to the Tanzanian Economic and Organised Crime Control Act. Since African Wildlife Foundation began holding wildlife judicial sensitization trainings, judicial officers, prosecutors, and investigators are increasingly pushing for more deterrent punishments for wildlife criminals. Poachers and traffickers are turning to more sophisticated means of acquiring wildlife products and smuggling them with impunity. To tackle these evolving threats, we help enhance information-sharing between various national agencies—as well as across borders. Wildlife judicial and prosecutorial trainings go a long way toward improving regional cooperation, as stakeholders get a rare opportunity to compare notes about their respective wildlife laws. AWF hosted representatives from Burundi, the Democratic Republic of the Congo, Ethiopia, Kenya, Tanzania, and Uganda in July 2016 to develop transboundary legal frameworks and communication networks. In March of the following year, AWF held a similar workshop for southern African countries with participants coming from Botswana, Mozambique, Namibia, South Africa, and Swaziland. 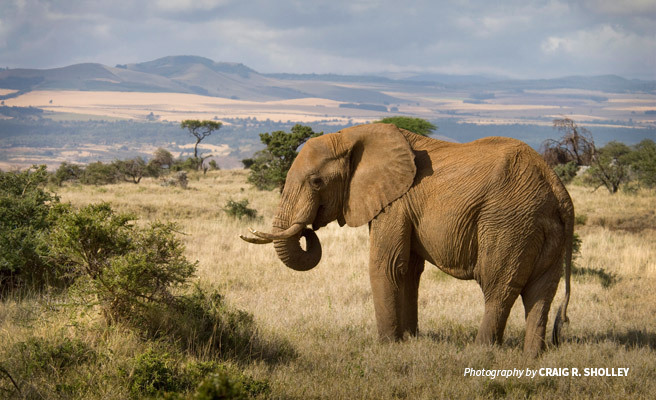 Ahead of these workshops, AWF’s Law Enforcement team had conducted a comparative analysis of wildlife laws in eastern Africa (Ethiopia, Kenya, Tanzania, and Uganda) and southern Africa (Botswana, Mozambique, South Africa, and Swaziland). The studies highlighted huge discrepancies in the penalties meted out for wildlife crimes by each country. Knowing this, wildlife criminals are transferring their activities to the countries that have weaker legislation. Transboundary intelligence networks allow investigators to nab poachers on the ground as well as catch traffickers moving wildlife contraband along illegal trade routes. AWF’s canine program — generously funded by the U.S. Department of State’s Bureau of International Narcotics and Law Enforcement Affairs — deploys sniffer dogs and handler units at target airports and seaports in the region to detect illicit wildlife products. 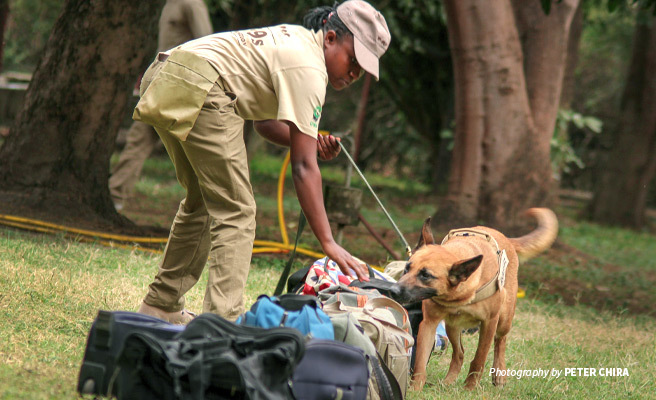 So far, AWF has partnered with various government agencies to train and deploy detection dogs and handlers in Tanzania, Kenya, Uganda, and Mozambique. The detection unit stationed at Entebbe International Airport screens up to 700,000 pieces of luggage exiting Uganda on target flights. They also conduct random searches on carry-on baggage as well as sacks of raw food and cargo consignments. At the Jomo Kenyatta International Airport in Nairobi, the highly trained canines and their handlers search an average of 10,000 check-in bags and cargo items per day. A 500-kg lot of pangolin scales has been among the bigger finds, as well as 65 kg of ivory en route from Mozambique. More consistent have been smaller, “shopping-bag” amounts of pangolin, as well as ivory trinkets that tourists were likely trying to bring home for personal use. Will Powell, director of AWF's Canines for Conservation program, has witnessed a noticeable reduction in trafficking attempts, particularly of ivory, in the locations where the canine units are deployed. However, teams are reportedly seeing an increase in pangolin trafficking, perhaps a sign that traffickers are adjusting their efforts to thwart dog detection. Those carrying smaller amounts of ivory home are also changing their tactics. Whereas before they had hidden their ivory inside of cardboard boxes or bags, people are now burying their trinkets inside cans of coffee or powdered milk where the scent might throw the dogs off. Others smear the contraband with chili powder or tobacco to irritate the dogs—but they still sniff out the ivory. To more closely connect the Canines for Conservation Program with our judicial efforts, AWF is planning a Canine Evidence Conference in March 2018, bringing together judicial officers, prosecutors, investigators, and detection dog handlers. Apart from increasing their understanding and general knowledge of wildlife law enforcement using wildlife detection dogs, they will also learn the evidentiary and procedural considerations for the use of wildlife detection dogs to recover evidence. Finally, governments and other organizations that had been unable, or unwilling, to make the hard choices to shut down wildlife trafficking are taking action. In 2015, former US President Barack Obama and Chinese President Xi Jinping made a joint pledge to ban ivory trade within their countries. The US ban took effect in June 2016 while the Chinese ban took effect on December 31, 2017. Following the ban in China, ivory carving factories, as well as ivory retailers, shut down operations. This is a landmark for a country considered to be the biggest consumer of ivory. Lawmakers in Hong Kong recently voted to ban domestic trade in ivory by 2021—a significant albeit risky step that could spur stockpiling of illegal ivory in the lead-up to the deadline. Although Vietnam and Thailand remain active markets, the shifts in policy can be upheld with firm law enforcement and education initiatives in demand centers. 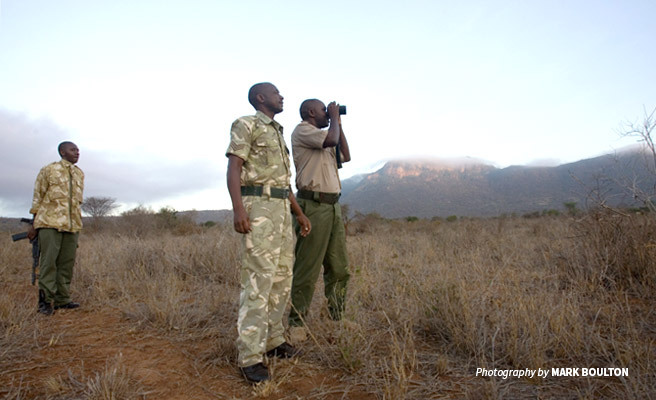 AWF’s work to reduce demand for illegal wildlife products includes educating consumers about the true cost of their desires. Apart from running successful awareness campaigns in China and Vietnam, AWF is also partnering with Beijing Zoo to enrich the experience of its 200,000 daily visitors with educational materials that foster an appreciation of the challenges facing Africa’s wildlife. Didi Wamukoya is AWF's Senior Manager, Wildlife Law Enforcement and is based in Nairobi, Kenya. Having graduated with a Masters Degree in Environmental Law from the University of Nairobi, Didi served as head of prosecution for the Kenya Wildlife Service for eight years. Her area of expertise lies in prosecuting and investigating wildlife crimes and training on wildlife laws, wildlife crime scene management and wildlife crime prosecution and investigation. Heading AWF's wildlife law enforcement program, Didi is engaged in judicial and prosecutorial trainings on wildlife crime, curriculum development for wildlife criminal justice assistance trainings, and analysis of wildlife laws in African countries.